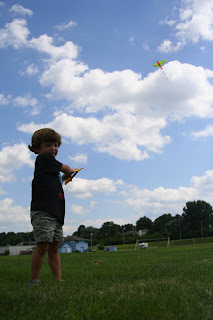 Took Ben out on a kite expedition this afternoon. He had SO much fun! Afterwards we went to the splash pad at one of the parks -- that didn't go over so well.. not to self: Ben's happier playing in pool than sprinklers. Visit the Picasa album to see more pics.